Maritimo has captured the best of both worlds with the new Maritimo M51 featuring the Full Fish Transom and enclosed flybridge. 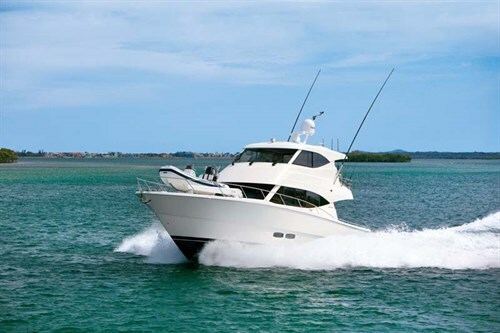 The Maritimo M51 is the natural progression from the popular Maritimo M48. The large convertible rear lounge module has been replaced by a fully integrated full fish transom, reflecting Maritimo’s commitment to the fishing crowd. International sales and marketing manager Greg Haines told me: "Maritimo has brought out some great new products over the past three years, with many improvements from personal use which includes our lifelong pursuits in offshore and inshore power and ski boat racing." Yet the new transom reflects Greg’s love for fishing and long-range cruising. Our vessel had a custom marlin board that was 300mm longer than usual. However, I still found it very easy to fish around as we set a spread of 80lb outfits towing large skirted lures. There’s minimal propwash at trolling speeds which allowed the lures full action in really clear, clean water. The transom is fitted with a huge cool box, complete with refrigeration units, that stands in the centre. A conveniently placed stainless barbecue is neatly moulded into the port-side coaming, with a huge fully plumbed livebait tank complete with viewing window sitting directly opposite in the starboard coaming. Possibly a little optimistic but a fantastic touch nonetheless. The Maritimo M48 and M51 luxury motor yachts virtually stand alone in their extended enclosed flybridge concept. Developed from client requests in international circles, this appealing elevated command centre has very efficient heating and cooling systems, with large opening windows as well as an overhead sunroof and rear door for those wanting a taste of the fresh sea breeze. This gorgeous platform provides fantastic visibility, not only allowing for rapid spotting of potential obstacles due to the height of the flybridge but also for identifying shoals for fishing and whale watching should you be lucky enough to spot those majestic creatures of the deep. even have an automatic setting. This feature has been warmly received by Maritimo customers from around Europe, Singapore and the USA as well as on the home turf of Australia and New Zealand. Meanwhile, the climate-controlled bridge allows for longer cruises as well, helping you arrive at your destination refreshed and energised, come rain, hail, tropical heat or artic cold. There’s a rear door to the flybridge extension with teak floor and a set of binnacle and bow thruster controls to operate when docking or fishing. Whilst the view of the rear deck is restricted, fish and line angles are easily seen. There’s even a further set of controls on the rear deck should you want to get closer to the action at hook-up time. Sadly, however, this is one appointment we missed out on. In typical Maritimo fashion, the overall upper story (including the helm) is well appointed, practical, stylish and functional. 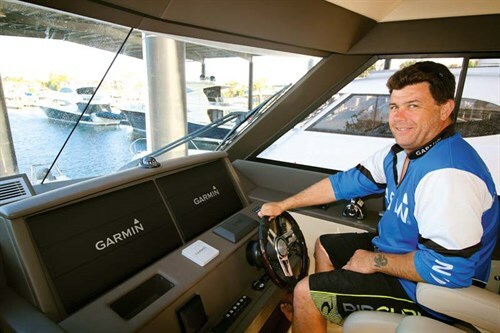 I was most impressed by the compact appeal of its pair of 8400 Series Garmins with twin 22in screens plus the Volvo Penta 7in Engine Monitoring Display that provides every bit of data you could possibly need, all in an eye-pleasing manner with an easy-to-operate menu system. The test boat’s flybridge was fitted with twin Pompanette helm chairs and a beautiful beige leather lounge that easily converts to a double berth. This unique feature further enhances the M51’s capabilities, including accommodation. Downstairs, the fit-out is virtually identical to the Maritimo M48. It’s a beautiful and very comfortable assembly of premium cabinetry, upholstery, appliances and fittings. The rich gloss-coated teak cabinetry contrasts well against the combination of grey trim and beige head lining and upholstery. The bow cabin has a lavishly trimmed queen-size island bed while the full-beam master stateroom features a diagonally mounted queen and additional chaise lounge. There’s plenty of light and air, the latest entertainment systems and accessories and the twin en suites are well equipped. There’s even a separate utility room complete with washer and dryer, while storage spaces abound. 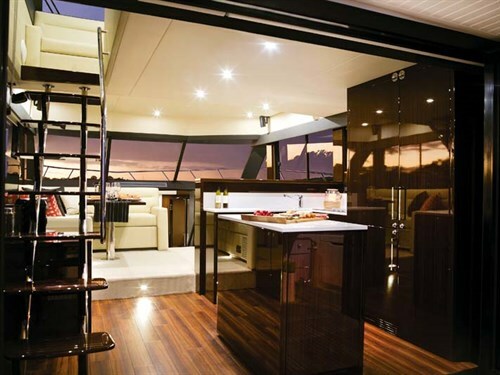 The saloon makes entertaining a breeze, with a large L-shaped lounge up front complete with a large dining table. There’s a further three-seater lounge opposite for those extra guests. The flybridge stairwell is on the port side surrounded by storage cabinets, including an electrical cabinet and pull-out drawer fridge. The galley features an island bench in the middle, complete with dishwasher, and the bone laminate bench tops contrast nicely against the gloss timber, lavish upholstery and trim, and there’s a fully fitted kitchen including induction cooktop, microwave, upright fridge, pantry and even a customised drawer to hold delicate wine glasses. The saloon feels light and airy, with panoramic views of your surrounds. The twin cantilevered doors to the rear deck really open up the saloon and add to the spaciousness of the vessel. If you’re of the same maritime mind as me, boating is all about being in the open air, and the Maritimo M51 doesn’t disappoint in this regard. For those of us wishing to entertain, the rear deck has plenty of room and lends itself to dining parties thanks to a folding setting in the lazarette, plus the utility room. The designers have combined all the fishing necessities with other outdoor pursuits to produce a really versatile and welcoming area. Our demo boat was the first of the full fish transom layouts – this will be available to all future 59, 64 and 70ft models. It was customised with dive compressor, an ice chipper feeding into a large underfloor kill tank, teak decks, game chair, rod holders and outriggers. There are easily accessed hatches in the floor leading to the lazarette and a central compartment that opens directly to the superb engine room. The power centre is compact but has all the necessary service points, sea strainers and fuel filters in easy-access locations. A Cummins/Onan 11kW generator runs the electrics when not on shore power and a 7L/h desalinator supplies plenty of fresh water for the 500L tank. Despite our best efforts our voyage was a fishless one, with the elusive blue marlin refusing all invitations. As we tucked our tails between our legs and set course for home, the swell picked up a couple of metres on the strong outgoing tide yet the M51 crossed the bar comfortably, thanks to its powerful twin shaft-drive Volvo Penta D11 670hp inline six-cylinder turbocharged and after-cooled diesels which reflect the long seagoing experience from all staff, including boss Bill Barry-Cotter and Greg Haines. The engines conform to US EPA tier-three emission standards and drive 32in Teignbridge Nibral propellers through shaft drives, all adding to the excellent seagoing ability of the design. Our boat was lightly loaded and returned a very pleasing cruising speed of 21.3kt at 2000rpm using a total of 185L/h as we cruised out into a head sea to the continental shelf. We returned at 22kt at 2070rpm using 190L/h with a small trailing sea. At slow trolling revs, she returned 4-6kt (head and following sea) at 600rpm, using as little as 8.2-8.6L/h total. When we opened the throttle at sea the M51 achieved a heady swell of 26kt at 2250rpm using 218L/h. Greg told me that, in idea conditions, the M51 will do up to 30kt at wide-open throttle (2400rpm). The Maritimo M51’s large hull rode beautifully through the one-metre sea in an effortless motion, despite its weight and top-heavy design. 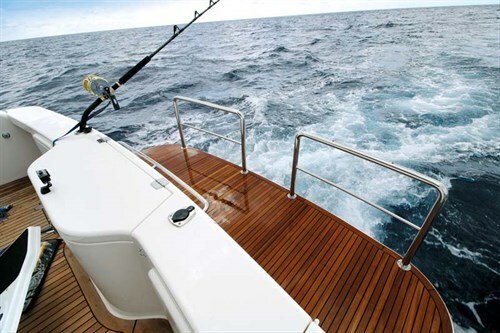 Maritimo also offers a Seakeeper stabiliser as a standard option though at slow speeds our vessel felt quite stable. It is a very easy boat to manoeuvre, and has deep coamings on the rear deck extending right up the bow for safe access. The design is complete, with many convenient grab rails and heavy bollards for confident mooring. As an added bonus, every Maritimo is fully sea trialled with engine representatives on board to commission their products. Quality is assured by each and every boat being inspected up to 14 times during the build process by an independent marine surveyor. 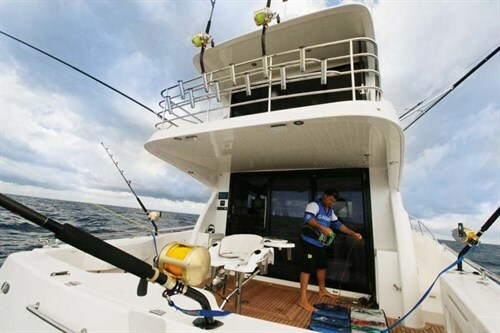 This highly competent, premium-quality and fully Australian-made cruiser will have great appeal in the cruising community worldwide and whilst it doesn’t pretend to be a purpose-built fishing vessel, the introduction of the full fish transom and other features make it into a highly capable multi-role vessel. Maritimo M51 with full fish transom, fitted with twin Volvo Penta D11 670hp inline six-cylinder turbocharged and after-cooled diesel engines. Three people on board, medium fuel and water loads. Note – figures supplied by Maritimo are for M48 with similar hull and engines but appears consistent with our sea trials. Browse our massive archive of Maritimo yacht reviews. See the full version of this review in Trade-A-Boat #485, January 2017. Why not subscribe today? This Maritimo S50 is what you get when someone wants a unique luxury motor yacht from Maritimo.